Featuring a collaboration with local NYC Chinatown brand CYNONYC. The print features one of the old retro signs of the restaurant during the early 20th century. 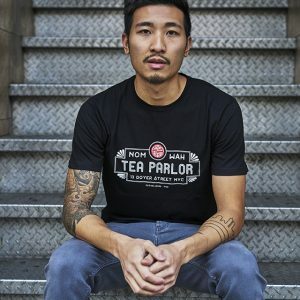 50% cotton, 50% polyester heather t-shirt, featuring soft neck tag and side tag stamped with CYNONYC and New York City in Chinese. Please consider ordering one size larger than your usual on account of the fact that this shirt runs small. Photos by Will Moy and An Rong Xu.